When I opened my fridge today I just couldn’t resist grabbing the bottle of Leninade that’s been staring at me for the past month or so. I’ve wanted to try Leninade for the past two or three years so when I found it in my local ACE Hardware I immediately placed into my basket. 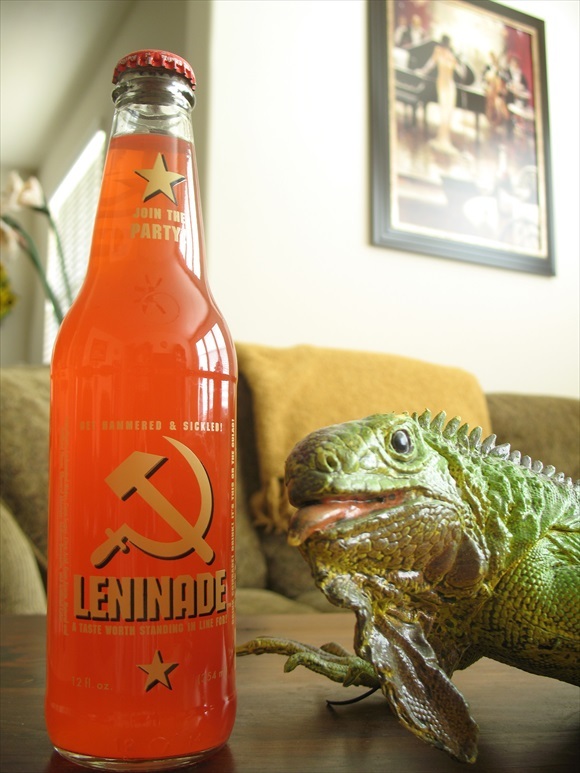 Leninade is of course a reddish beverage who’s bottle sports such slogans as “Join the Party!”, “Get Hammered & Sickled!” and the slightly more obscure “A Taste Worth Standing in Line For!”. The back has a few words written in Russian as well as another amusing statement, “Our 5-Year Plan: Drink a bottle a day for five years and become a Hero of Socialist Flavor.” So Leninade is already winning the war in style points. They’ve themed this bottle to an impressive point and I’ve taken notice. It’s one of the reasons I’ve wanted to try this beverage for so long. Looking at the ingredients I see that Cane Sugar is the sweetener of choice for Leninade. Good for them. I can only assume that with a name like Leninade I’m about to consume a soda that tastes somewhat like lemonade. It rhymes, so why would it taste like anything else. That’s solid logic… right? Ok, so I need to hush up and drink now. See you on the other side of the smell paragraph. Ok, before I start this I noticed something stamped on my bottle. Not something printed on the official label, but stamped… like the expiration date kind of stamped. It’s a sentence that reads “Imagine All the Soda”. That’s it and it makes me really happy for some reason because I am imagining “All the Soda”. Anywho… the aroma that is assaulting my nose is that of a very caustic sour lemon. So apparently my rhyming logic may end up proving true. I have no doubts that this beverage will declare war on my throat because it’s made by Real Soda, a brand that has burnt my mouth on more than one occasion. Well this isn’t as caustic or amazing as I thought it would be. It certainly is lemonade based like I predicted, but to be more specific it’s “pink” lemonade. The communist jokes just keep on coming for the folks at Real Soda. The amount of tart has been increased just a bit from your common pink lemonade and of course it’s carbonated. Lemonade with carbonation is normally a win/win situation. You get the tastiness of lemonade with the fun fizziness of carbonation. Like I said, win/win. Leninade does indeed have the fun combo, but nothing else really stands out about this product. With all the theming they put into the bottle I really hoped that the soda inside would be more than average. If you want a fizzy, somewhat-sour pink lemonade with an average aftertaste then look no further because mediocrity is staring you in the face. Now, if you’re a collector of amusing bottles or fake U.S.S.R. memorabilia then Leninade was made for you and should be used at your birthday/wedding/funeral. Your decision, Comrade. Twist served in the Soviet Army back in the late 1800's... something about impressing a woman.